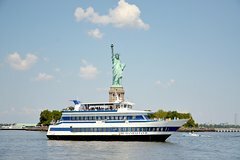 Liberty Cruise is the best way to see the Statue of Liberty and Liberty Island, South Street Seaport, Battery Park, Wall Street, Manhattan Bridge, the Brooklyn Bridge, Governor’s Island, Ellis Island, the historical Immigration Center, the World Trade Center, World Financial Center and many more. Liberty Cruise passes by all of the sites two times which doubles the opportunity to observe them and take pictures of New York Harbor’s priceless views. It departs from World Financial Center Terminal (Battery Park City on Vessey Street). This is a great opportunity to learn many historical and interesting facts about New York harbor. Liberty Cruises are narrated by live and licensed tour guides. Sometimes the best way to see New York City is from the water. That's where New York Water Tours comes in. Aboard a sprawling, open-air boat, the company whisks visitors through New York Harbor, passing beneath the Brooklyn Bridge and the Manhattan Bridge along the way. It also cruises past Battery Park and alongside famous landmarks including the pièce de résistance: the Statue of Liberty. Throughout the tour, guides share historical facts on everything from the origins of Wall Street to how Governor's Island began as City Comptroller's Island. Explore the city skyline from our Liberty Cruise around the Statue of Liberty. With the help of an automated and live tour guide, you and your family couldn't find a more thorough and exciting sightseeing tour. Whether visiting for the first time or a New York native, you're guaranteed to fall in love with the city all over again. So why wait?